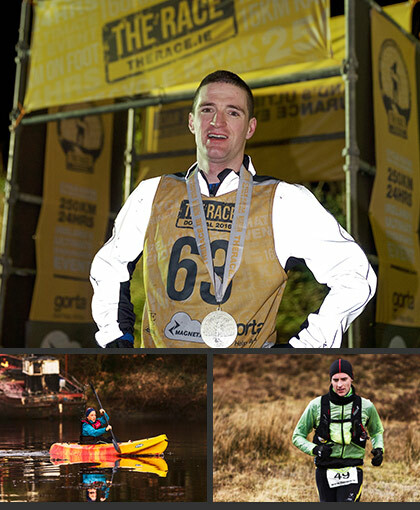 The Race is a 250 km unsupported endurance event across the rugged landscape of North West Donegal. To finish competitors have to complete 15km of kayaking, 166km of cycling, 5km of mountain running and 64km of road and trail running. Crucially, they must complete all this in under 24 hours. It is aimed at providing the ultimate 24 hour test of endurance. North West Donegal has been chosen for The Race 2017 as it provides the perfect blend of beauty and more importantly, difficulty. The Race is held in early March to increase the chances of challenging weather conditions during the event. It is the toughest of courses at the toughest of times. In many cases it is how an athlete deals with the wind, rain or snow that will determine if they have what it takes to finish. There is no typical competitor. Competitors come from a variety of backgrounds and disciplines. You do not need to be an elite runner, cyclist or kayaker. Those who compete in and complete The Race will be those who refuse to give up. The focus of the The Race will be on the quality of experience rather than quantity of participants. The field will be limited to 150 participants to protect the local environment which includes Glenveagh National Park. The intention is not to exclude but rather to create an experience that will be one of the toughest but also most memorable of a competitor's life. The Race is a not for profit event will all proceeds going towards the work of Self Help Africa. It is organised by Sand2Snow Adventures and Gartan Outdoor Education Center. An animated fly-through of our 250km course in North West Donegal. Spanning 250km, THE RACE hugs Donegal's spectacular coast, ascends one of its highest peaks and winds through its rugged wilderness. There are limited places available for THE RACE. Signing up now is the first step towards one of the toughest and most rewarding experiences of your life. Spanning 250km, THE RACE course hugs Donegal's spectacular coast, ascends one of its highest peaks and winds its way through rugged wilderness. A small field means a personalised experience for each competitor. Our experts are on hand to offer advice with regard to preparation, training and nutrition.